Wood, Frank Watson (1862-1953). Watercolour and gouache. Unsigned or dated. This watercolour painting, fortified by the odd touch of gouache, is very finely painted with accurate and detailed drafting and Wood's sea and overall colours. But although in most aspects it is in the style of Frank Watson Wood (1862-1953), the fine detail and the medium used was generally not Wood's way. 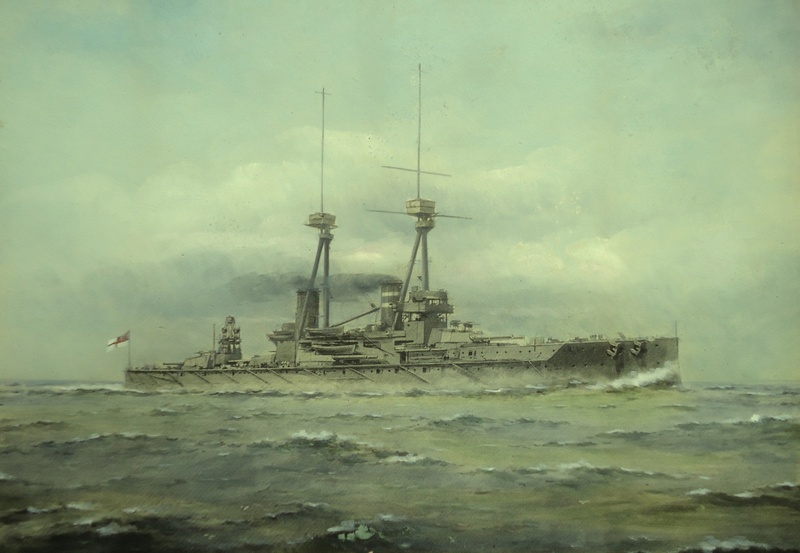 But what is certain is that its a Bellerophon class dreadnought and the two white bands on the for'rd funnel signify the ship as SUPERB; moreover, no gaff on the mainmast indicates its the battleship as she first appeared when completed in May 1909: in a refit in 1912/13 all three sisters (BELLEROPHON and TEMERAIRE were the other two) were fitted with this distinctive feature lacking here.